Bachelor of Fine Arts from the University of Barcelona in the specialty of painting. 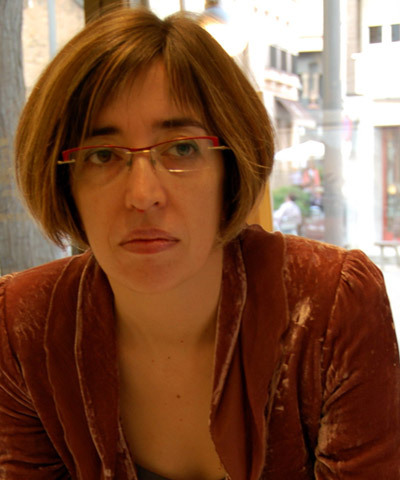 Her first solo exhibition was in 2003 in Espacio Lluís Ribas de Sant Cugat (Barcelona). Isabel Cortes painting is based on the study of flowers and their life cycle, used as an allegory of life. Her paintings are sometimes presented as several separate sets of images. When joined they tell a story that relates to the description of ephemeral beauty. Her meticulous and well planned work is executed masterfully and could be described as contemporary hyperrealism. Summer scholarship in 2000, the Royal Artistic Circle of Barcelona. Selected for the international competition UBS Art Award 2000 exhibition at UBS (Union Bank of Switzerland), Madrid 2000/2001. Preset in the I Figurative Painting Competition 2006, organized by the Foundation of the Arts and Artists (Barcelona / Marbella). The gallery space Lluis Ribas de Sant Cugat del Vallés (Barcelona), has been the exclusive representative of my artistic work for 3 years (2002-2005). First solo exhibition in Space Lluis Ribas, march into space individually Lluis Ribas 2003. Exposició, March 2004. Solo exhibition at the Space Lluis Ribas, in February 2005. Solo exhibition at Subex Gallery, Barcelona, ​​2006. Solo exhibition at Subex Gallery, in April 2009. 2002 Collective Space Lluis Ribas, in January 2002. Space exhibition at Lluis Ribas in “II Noche del Arte de Sant Cugat del Vallés”, in May 2003. Exhibition at the Luis Ribas Area, “II Noche del Arte de Sant Cugat del Vallés”, in May 2004. Group exhibition in Switzerland, 2007. Group Exhibitions 2008: International Art Fair in Holland with SammerGallery (Marbella). Fall and Christmas collectives in Ricard Gallery Terrassa. Christmas Collective in Espacio Lluis Ribas de San Cugat. Col·lectiva summer Subex Gallery, July-September 2010. Group Exhibitions 2011 – 2012 | Espacio Lluis Ribas de Sant Cugat, Subex Gallery – Barcelona. 2011 | Modelo del monumento a la República (Cerdanyola del Valles) of master sculptor Salvador Crafty (author of the Memorial Fellow Cerdanyola, la C, and the Summer 1992 Olympics medal among others). 2012 | exhibition at Subex Gallery, Barcelona, ​​from January to February, winter and September collective, Summer collective. 2013 | International Art Fair of Strasbourg: ST. ART, with the Espacio Lluis Ribas Gallery.